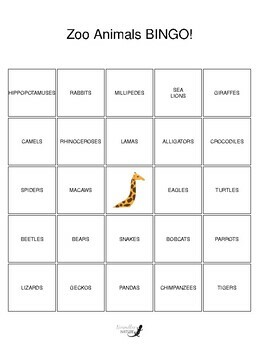 Zoo animals themed bingo game! This bingo set includes 35 game cards. Clip art in the middle of each board is a "FREE space." Word calling cards are included. 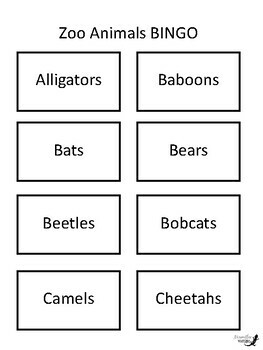 Great game to learn animal names. Also great for beginning readers. Perfect for second, third, fourth, and fifth grades. Just print and enjoy! 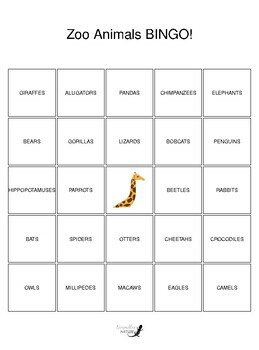 Forty animals are used to create these bingo boards including: alligators, baboons, bats, bears, beetles, bobcats, camels, cheetahs, chimpanzees, crocodiles, eagles, elephants, flamingos, frogs, geckos, giraffes, goats, gorillas, hippopotamuses, lamas, lions, lizards, macaws, millipedes, monkeys, otters, owls, pandas, parrots, penguins, rabbits, rhinoceroses, sea lions, seals, snakes, spiders, tigers, tortoises, turtles, and zebras. 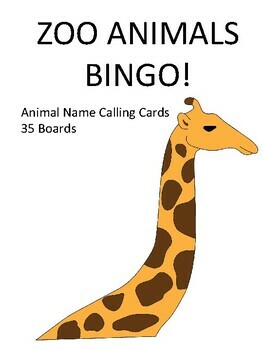 See also: Rainforest Animals BINGO, Farm Animal BINGO, and Arctic Animals BINGO!